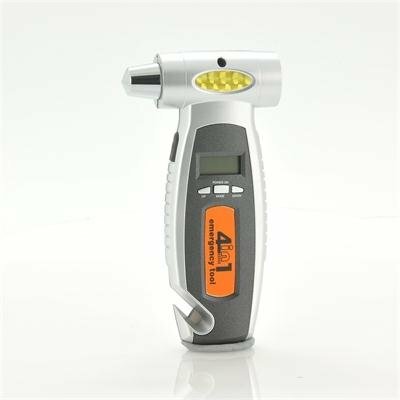 Successfully Added Car Emergency Tool - 4-in-One: Tire Pressure Gauge, Seat Belt Cutter, LED Flashlight, Window Hammer to your Shopping Cart. 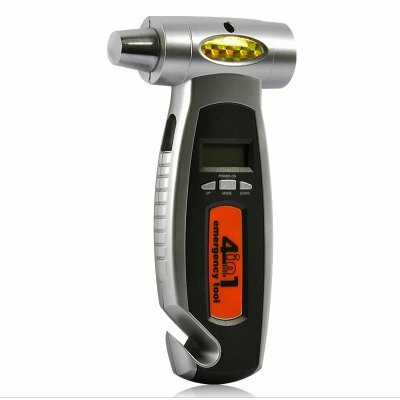 4 in one digital tire gauge is an all in one vehicle safety device featuring a seat belt cutter, LED flashlight and emergency window hammer for those long journeys on the roads or in case of an emergency! This must have car safety accessory has an ergonomic design and is a perfect way to check on your vehicles tires, sounding an alarm when the tire pressure is less than or greater than 3psi. And in case you get into any trouble on the road at night you can use its handy LED light as you wait for a safety recovery vehicle to arrive! In addition, this digital tire gauge device doubles as a seat belt cutter and emergency window hammer that will be your savior in any car accident. Ideal for your vehicle as a safety precaution in case of an accident or a break down. Or buy one to place in your wife’s vehicle or order bulk quantity at discounted wholesale price to sell and PROFIT! Available from your trusted source of direct-from-factory electronics, Chinavasion.